Well, the hot, humid and sticky summer is coming to a close! Great, now the best golfing weather of the year is just starting. Get out your clubs, remove the rust spots, and sand down your shiny grips. This new column, dedicated to the golfers on Okinawa, will provide you with golf tips, equipment, issues, news, and much more. Get ready for Par Play! What's New? Not only is the weather inviting, but so is the golf in other parts of Asia as well. 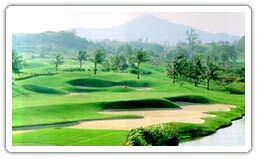 Right now, MCCS Tours Plus is offering a 5-day golf vacation to Pattaya, Thailand -- the golfing paradise of Asia. The trip includes hotel, airfare, golf, and a two-hour golf lesson on some of the best courses in Asia. The trip is scheduled for 26-30 October. Contact MCCS Tours Plus now at 646-3502/3503. PAR Play Tip! How do I cure my slice? Ok, here is a "keep it simple" cure to help you tame that slice. First of all, a slice is caused by an open clubface on impact! Nothing else! You may be doing several things that contribute to this open face including having an incorrect swing path, but here is one simple point to check, and a cure for you to try. Your grip may be too weak. Most amateur golfers place a great amount of emphasis on the right hand when it comes to a weak or strong grip. But, it's usually a "weak" left hand that contributes to a sliced ball. Be sure the "V" formed between the left thumb and fore finger of the left hand points toward your right shoulder at the set-up. A weak grip will have the "V" pointing to your chin. Give it a try! Now, Play golf!